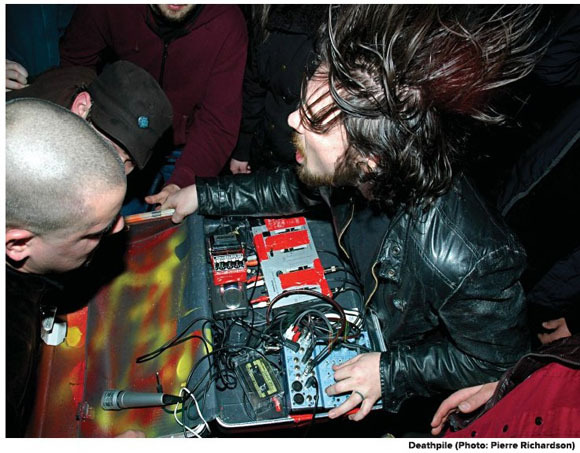 The current issue (#20) has plenty to appeal to CDM readers: Matmos on the cover, a roundup of custom ensembles for Native Instruments Reaktor, gear and music reviews, and even live music coverage. The spirit of the magazine I think is embodied in this shot from Brooklyn’s No Fun Festival. (Deathpile, photographed by Pierre Richardson.) I go for more of a well-groomed thang, myself, but it’s great to see one magazine avoiding the hype and heading straight for electronic music’s raunchy, punk underbelly. On the downside, the magazine continues to suffer from the “White guy hanging out along somewhere looking dour” syndrome with the artists it covers, but the online format makes it even easier to skip ahead to the geeky bits. And unlike some attempts to create online magazine interfaces, this one is fairly readable, with a download option. Which do you think sells better? Now if we could somehow add a little of the latter to the CDM formula, I’m sure this could be really big. Oh, and tattoos. Gotta have tattoos.